Magical matchwinners have been hoovering up English football’s individual prizes ever since the Premier League came into existence. Manchester United great Paul McGrath landed the PFA Player of the Year gong at the end of the inaugural 1992-93 Premier League campaign, but in the ensuing 25 years, Chelsea legend John Terry (2005) is the only other central defender to have been held in such high esteem by his peers. A quick glance through the all-star cast confirms that just two other men who are not known for their dancing feet or goal-munching magnificence have been regarded as top dogs. The irrepressible Roy Keane could not be ignored in 2000, and serial title-inspirer N’Golo Kante deservedly walked away with the trophy in 2017. So…the historical message is pretty simple. For a defensive player to win PFA Player of the Year, it requires you to be a very, very special performer. 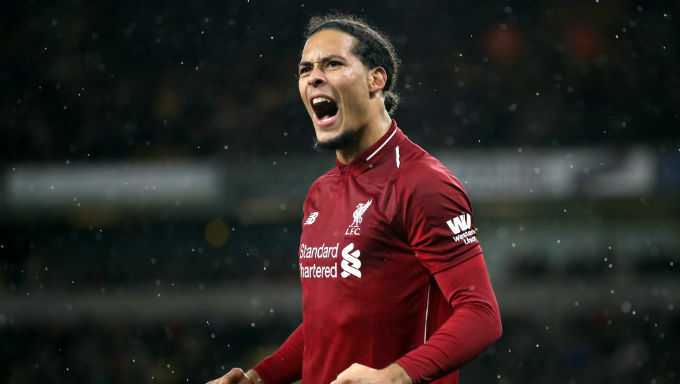 However, this season I believe we have one, in the shape of Liverpool giant Virgil van Dijk. Making those around him feel so much more assured, the Rolls-Royce centre back has transformed Jurgen Klopp’s rearguard within the space of 12 ever-increasingly watertight months. In the calendar year of 2017, the Reds conceded 60 goals from 54 matches. Yet since Van Dijk arrived at Anfield at the beginning of 2018, Liverpool have trimmed that to just 45 goals in 53 contests in the year just gone. During the same period, Liverpool’s clean sheet count also rose rom 20 to 25. It’s not just the Van Dijk show. The likes of Alisson, Andrew Robertson, Joe Gomez and Trent Alexander-Arnold have all played their part. But it is the imperious Netherlands international who holds the back four, and team, together. Why is Van Dijk So Good? Using his power, pace and game management consistently well, Van Dijk oozes calm authority. He makes more passes, clearances, blocks and interceptions than any teammate, and has won more than twice as many aerial duels as the closest Liverpool man. We can all see his dominance with our eyes; but reassuringly the data confirms it. In a side containing the mercurial Mo Salah, Sadio Mane and Roberto Firmino, it’s a testament to the Dutchman’s quality that he’s quickly become Klopp’s main man. Trimmed in from 16/1 the week before Christmas, the bookmakers are now convinced Van Dijk will buck the usual trend, by winning this season’s Player of the Year. And I have to say I’m in full agreement. With no sign of an impending second-half-of-the-season wobble yet, the 27-year-old is currently 11/10 favourite (Bet365) to land the coveted gong. Barring a lengthy spell on the sidelines or a spectacular collapse, he looks a pretty safe bet. Who can push Van Dijk hardest between now and May? If Manchester City fly around the final bend with a grandstand finish that pips current Premier League title favourites Liverpool to the post, David Silva will certainly be in the frame. The 32-year-old has been sensationally good in Kevin de Bruyne’s absence – stepping up to the plate just when Pep Guardiola needed him – and the veteran Spaniard is rightly regarded as second favourite at 7/1 with Paddy Power. A little like Van Dijk’s influence at Anfield, City just aren’t the same without Silva, who has relished a box-to-box role this term. Raheem Sterling (12/1 Bet Victor) is the only other Manchester City star in the frame, and while he’s been undeniably brilliant, you suspect the England international needs a glut of late season goals to stand a prayer of usurping the two top picks. With the PFA voting forms sent out by Easter, I just don’t know if there’s enough time for a City player to stake a serious claim. If you fancy a different Liverpool winner, Bet365 are offering 9/1 on Mo Salah going back-to-back with PFA Player of the Year awards, a feat only previously managed by Thierry Henry and Cristiano Ronaldo. Given the Egyptian’s winter uplift in goals and form that’s a gamble to consider, but it’s hard to envisage Salah leapfrogging Van Dijk. When judging solo awards like this, I always think there is one critical question to ponder. Would this players’ team be anywhere near as good without him? The answer in Van Dijk’s case across 2018-19 is an absolutely unqualified ‘no’. Standing out like a sore thumb as a defender with elite credentials, Liverpool’s bedrock has to be in pole position to join that rare band of defenders in the PFA Hall of Fame. He most definitely feels like the Player of the Year in waiting.